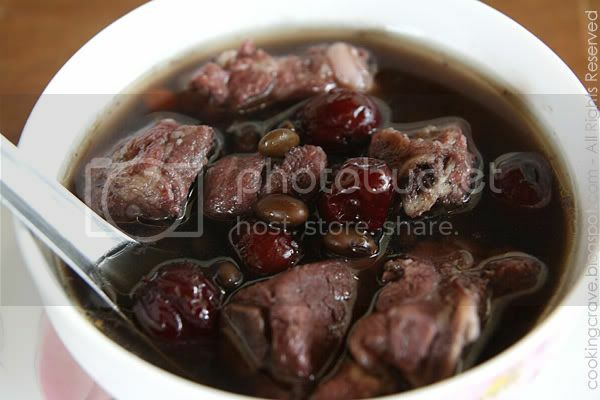 Black beans and pork ribs makes good combination for this soup. It doesn't taste that delicious if we replace pork ribs with chicken. I have my own secret recipe for this soup by adding few slices of ginseng in it. 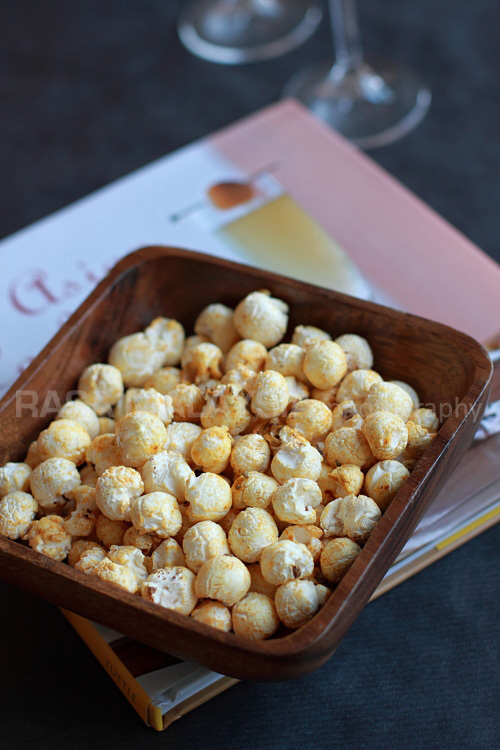 It taste extremely delicious that everyone must try okay?? That's how I trick my kids to have ginseng as well ~lol. The ginseng chicken soup taste way too bitter for them. 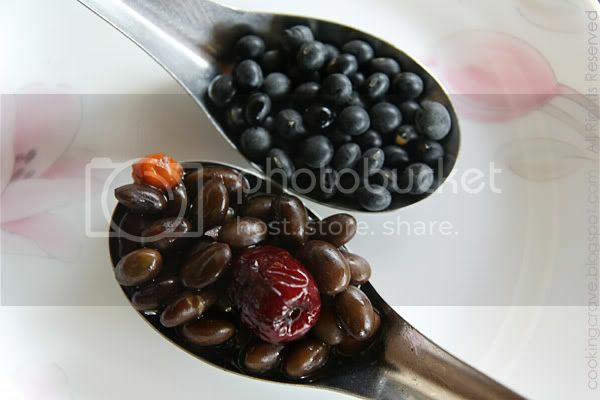 pic above: The different between the cooked and un-cooked black beans. It'll expand double it's size when the beans are cooked. Pick up damage black bean and raise, clean it with water. 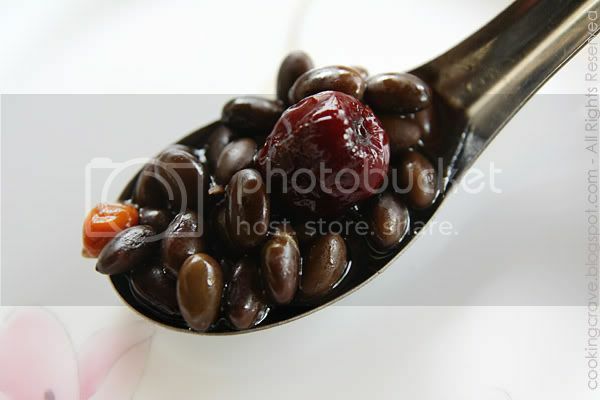 Place the black beans in a bowl and pre-soak it overnight. The beans will expand to double its actual size. Wash and blanch the pork ribs with hot boiling water (for clearer soup and clean the meat purposes) and place the meat into double-boiler pot. 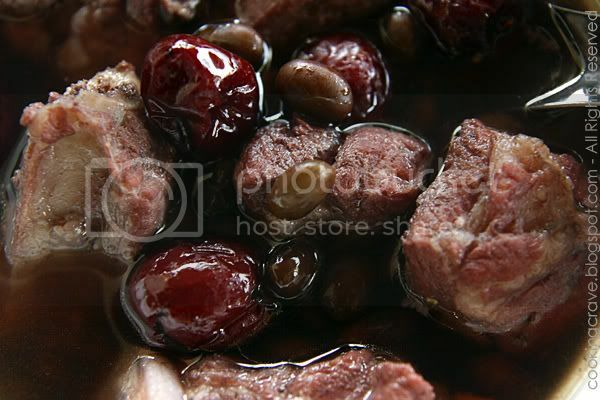 Add in pre-soaked black beans, red dates, wolf berries and ginseng slices. Pour in 1.5 litre water (normally I will use hot water for faster boiling) and fill the lower layer of the pot water and start cooking it in high heat till the water are boiling. Once the water are boiling, turn down the heat and cook it in low heat for 60mins. After 60mins, the black beans shall be soft at this time. Turn off the heat and add salt to taste. wow Amy.. i really have to salute u... and a few others as well... really envy u all.. can cook so well.. your husband must be very blessed to have u for a wife and yr kids to have u as their mum! I love pork ribs but black bean...hmmm...not a big fan. How does it taste, sour, salty, or slightly sweet? Mostly likely good coming from your kitchen. Claire : Thank you. I'm still learning to be a good chef actually. Wow - it looks so hearty and delicious.